Phthalates are widely used chemicals often used to make plastic flexible. They're commonly found in shower curtains, medical tubing and plastic toys, as well as in numerous personal care products such as fragrances, nail polish and lotions. Because the chemicals are so widely used, they're also present in drinking water supplies. Known to cause reproductive and developmental toxicity in animal studies, phthalates can also impact thyroid regulation by decreasing thyroid hormone receptor activity -- at levels found in drinking water. Currently, drinking water treatments do not effectively remove thyroid-disrupting chemicals like phthalates from your drinking water. Polybrominated diphenyl ether (PBDE) are flame retardant chemicals commonly used in furniture foam, carpets, upholstery, clothing, toys, draperies, electronics and more. It's estimated that up to 97 percent of Americans have PBDEs in their blood. In one study on frog tadpoles, low levels of BPA exposure -- similar to those found in human infants -- interfered with the T3 hormone and thereby suppressed genes controlled by T3, resulting in slowed development and other changes. Previous animal studies have also linked BPA to disruptions in thyroid receptors and thyroid function. Dioxin is a group of chemicals -- including polychlorinated biphenyls (PCBs), polychlorinated dibenzo dioxins (PCDDs), and polychlorinated dibenzo furans (PCDFs) -- that are formed as byproducts from industrial processes like chlorine paper bleaching, pesticide manufacturing and smelting. Dioxin was also a part of the toxic Agent Orange used during the Vietnam War. PFOA and a related chemical called PFOS (perfluorooctane sulfonate) -- widely used in nonstick cookware, stain-resistant materials and food packaging -- can also cause trouble with your thyroid. One study found that people with high levels of PFOA in their blood were twice as likely to have thyroid problems as those with the lowest levels while past studies have also linked the chemical to decreased thyroid hormone levels. It's not known how PFOA may cause thyroid disease, or whether the chemical directly impacts the thyroid or instead the immune system, causing it to attack the thyroid gland. Most municipal drinking water supplies in the United States contain added fluoride, a measure that's intended to reduce rates of tooth decay. It can also enter water supplies from fluoride-containing rocks and soils. Research suggests it can inhibit your thyorid's ability to absorb iodine, leading to an underactive thyroid, or hypothyroidism, even at low-level exposure. In a study by the Centers for Disease Control and Prevention, it was estimated that 44 million U.S. women -- including those who are pregnant, have lower iodine levels or have subclinical hypothyroidism -- could be at increased risk of thyroid problems from perchlorate exposure. Buy children's toys made of natural materials, or at least phthalate-free plastic. With the evidence increasingly showing that exposure to environmental chemicals, even at low levels, can negatively impact your thyroid, and the knowledge that even small changes in your thyroid homeostasis can influence your health, it's important to reduce your exposure as much as possible. 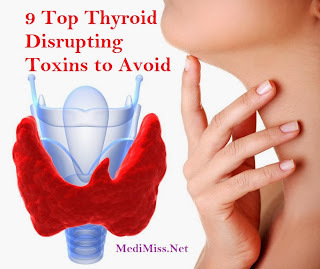 By making small changes in your food choices and your personal care products and paying special attention to finding household goods made from primarily natural sources, you'll be off to a great start in protecting your thyroid function from these pervasive toxins. By Dr Brandon Credeur, D.C.